The Rainbow Letters started as a way to hear the stories of people like us who have lesbian, gay, bisexual, transgender, and/or queer (LGBTQ) parents through the art of letter writing. We partnered with COLAGE in 2014 and have since collected more than 70 letters telling the stories of those of us who don’t belong to “traditional” families. 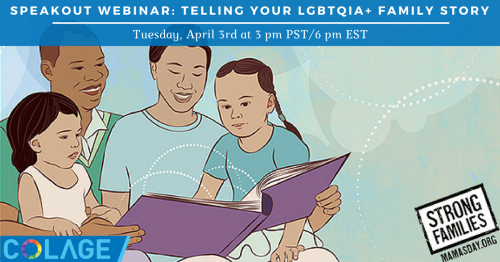 Now we are inviting all people to tell their LGBTQ family stories: children, kids, parents, siblings, and friends. As political and social injustices become increasingly toxic, it is essential that we come together as a community and share our experiences. We hope to inspire new narratives around family, for both ourselves and questioning LGBTQ youth. Our mission is to generate empathy, equality, and paint a picture of a new and varied “normal” when it comes to family. What does “family” mean to you? Join us in The Rainbow Letters movement by reading, writing and sharing letters to explore this question. Together we can all help the world grow a bigger, warmer heart. Mark your calendars for Tuesday, April 3rd at 3 pm PST/ 6 pm EST! Join COLAGE staff Tuesday, April 3rd for another SpeakOUT webinar. This workshop will teach you how to share your LGBTQIA+ family story and will be co-hosted by The Rainbow Letters. All are welcome!